The it band of the 90s, the Backstreet Boys, are hoping to wow fans on their cruise. The four remaining band members, Brian, Nick, Howie and AJ, took to their official Twitter page to announce the exciting news. "BACKSTREET BOYS CRUISE!!! Pre-SAIL March 15th at 12:00PM EST to FC members only first. Keep checking the site for more Cruise details..."
The boys have been trying to bring back the BSB hype ever since their demise in 2002. Following their hiatus, comeback and Kevin's departure, the boys have not been the same. This A-Lister attended their 2005 and 2008 shows in London, Ontario, but the aura had clearly changed. BSB's golden age was reflected by sold out stadiums and arenas, overpriced tickets and screaming fans. Their recent shows are in smaller venues, moderate ticket pricing, and a bunch of 20 somethings reliving their past. Sorry boys, but the glory days are over. 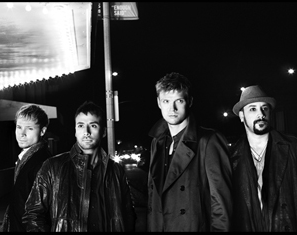 If you are still a Backstreet Boy 4 Lifer, click here for more information and to reserve your ticket. you are my fire. the one. desire.